Buy Sesame Snaps Plain - Multipack 4 packs of 3 snaps in the UK from our online shop or directly from our independent Scottish store. Tasty, gluten free, vegan, vegetarian sesame snaps. Multi pack with 4 x 3 snaps. Tasty, gluten free, vegan, vegetarian sesame snaps. Multi buy pack to save money. We sell real Sesame and other Sweets directly from our shop in Scotland and online throughout the UK. View more products from Sesame. Where can you buy real Sesame Snaps 4 Pack safely online? If you are wondering where you can buy Sesame Snaps Plain - Multipack 4 packs of 3 snaps safely online in the UK, then shop with us. 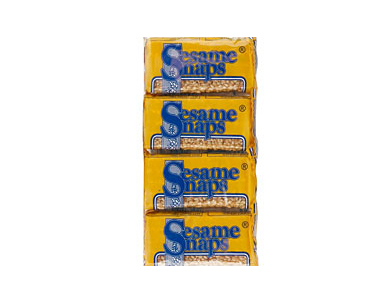 Sesame Snaps 4 Pack - Sesame Snaps Plain - Multipack 4 packs of 3 snaps in Sweets and Confectionery.